Vitra Tip Ton Forward-Tilting, Stackable Chair (VITTIPTON) at Pure Design Kids / Seating / Rockers ::: Kids' Toys, Furniture and More at Pure Design Kids! 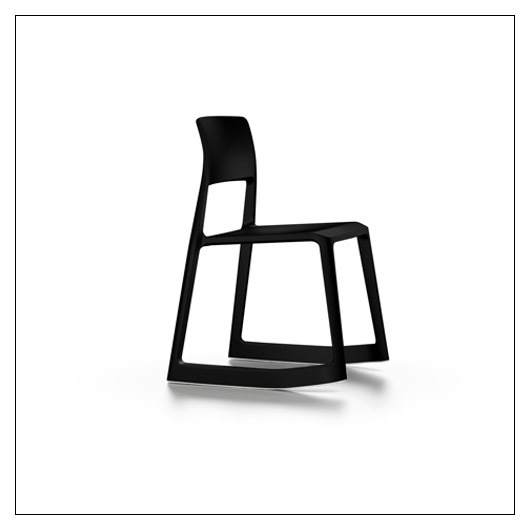 Tip Ton defines a whole new chair typology: the solid plastic chair with forward-tilt action. Its name refers to the dual sitting positions provided by the chair - from a normal position, Tip Ton can be tilted forward a few degrees where the chair then stays in place. The forward-tilt position, until now the preserve of mechanical office chairs, straightens the pelvis and spine and thus improves circulation to the abdominal and back muscles. Tip Ton is made of polypropylene and manufactured from a single mould without any mechanical components. This makes the chair extremely durable and 100% recyclable. Tip Ton can be stacked up to four chairs high and comes in eight different colours. Outdoor use: the colours earth grey, ice grey, glacier blue, basic dark and white are suitable for outdoor use. Special additives retard the fading of colours due to UV radiation. However, if the chair is exposed to sunlight for prolonged periods, the colour may change over time. We recommend limited exposure to sunlight. USA sales only. Please allow an additional 7 days to ship.